We’d love your help. Let us know what’s wrong with this preview of Tales of the Slayer, Vol. 1 by Doranna Durgin. A collection of original short stories based on the hit TV series created by Joss Whedon. Into every generation, a Slayer is born. One girl in all the world, to find the vampires where they gather, and to stop the spread of their evil and the swell of their numbers. In our time, that girl is Buffy Summers. But Buffy is merely one Slayer in an eternal continuum of warriors f A collection of original short stories based on the hit TV series created by Joss Whedon. Into every generation, a Slayer is born. One girl in all the world, to find the vampires where they gather, and to stop the spread of their evil and the swell of their numbers. In our time, that girl is Buffy Summers. But Buffy is merely one Slayer in an eternal continuum of warriors for the Powers That Be. We've known of others; The Primal Slayer, who stalked the earth and the forces of darkness in fierce solitude... Nikki, the funky hipster whose demise at Spike's hands lent an urban edge to his wardrobe and a bigger bounce to his swagger. Slayers by nature have a limited life expectancy; for each one who falls, another rises to take her place. To ask other readers questions about Tales of the Slayer, Vol. 1, please sign up. Overall, a good book. Seems like there were a lot of stories about death. Poor Slayers. Sad that most of them had short lives. This review has been hidden because it contains spoilers. To view it, click here. As a fan of Buffy the Vampire Slayer, I have always been fascinated by the aspect of untold stories of past slayers. In fact, the concept of multiple authors lending their voices to the history of the Chosen One was what made me so intrigued by Tales of the Slayer when I first learned of it’s existence. The book contains short stories from seven different historic periods including Roanoke, women who are absolute badasses (part of what I loved so much from the show), and vampires being staked t As a fan of Buffy the Vampire Slayer, I have always been fascinated by the aspect of untold stories of past slayers. In fact, the concept of multiple authors lending their voices to the history of the Chosen One was what made me so intrigued by Tales of the Slayer when I first learned of it’s existence. The book contains short stories from seven different historic periods including Roanoke, women who are absolute badasses (part of what I loved so much from the show), and vampires being staked to dust. So of course, the moment the book was in my possession I started reading it. Although I enjoyed each story overall, I found some characters difficult to relate to. One example is Marie-Christine Du Lac, a slayer and main character from Unholy Madness by Nancy Holder. Du Lac grew up in the home of Marie Antoinette, a servant to those who deem themselves more important than the peasants. Despite this, she is treated to a much more desirable life. Marie-Christine often came off as rude or hateful, especially in regards to the lower class. In one instance, she even says that the children of the lower classes appear to be barely human. To be honest, I didn’t even like her watcher - which is what the person who prepares the Slayer for her battle against demonic forces is called. Edmund was just as rude and hateful as his ward. Not that every character needs to be likable for a story to be interesting, but it certainly makes it hard to empathize as you follow along. Of the seven stories, my two favourites were Mornglom Dreaming by Doranna Durgin and And White Splits the Night by Yvonne Navarro. In Mornglom Dreaming, we are introduced to a Kentuckian named Mollie Prater who knows absolutely nothing of vampires, let alone demons and slayers. However, just days before her wedding in 1886, Mollie begins to feel different - faster, and stronger. This change coincides with reports of a beast that has been attacking the people who share the hollow Mollie resides in. On the day of her wedding, the demon and her watcher reveal themselves. Despite saving all but one person from death, both her and her future husband’s families no longer recognize her as the person they once knew. At this point, Mollie realizes her life will never be the same. In Yvonne Navarro’s short story And White Splits the Night, rampant racism in Florida during 1956 makes it difficult for seventeen-year-old Asha Sayre to be the slayer, especially as she travels into town to investigate bodies that continue to make their way into the nearby swamp where she lives. The bodies remind her of twelve years prior, when she found her father hanging from a tree in the very same swamp after having been dragged through the trees by Klu Klux Klan members. And White Splits the Night was most definitely my favourite story from this volume. I loved Asha and her relationship with Laurent - she respected her watcher and listened to her instructions. She was young but strong and brave, even in the face of death. I'm a huge fan of the cult show Buffy the Vampire Slayer. I'm also a huge fan of historical fiction. So imagine my delight when I stumbled upon these short story collections. My love of historical fiction mashed up with my endless fascination with Buffy mythology? I was sold. There are seven stories, each depicting a snippet of Slayer life during various historical periods, from a countless Slayer realizing class difficulty during the French Revolution, to a girl bravely entering the service of I'm a huge fan of the cult show Buffy the Vampire Slayer. I'm also a huge fan of historical fiction. So imagine my delight when I stumbled upon these short story collections. My love of historical fiction mashed up with my endless fascination with Buffy mythology? I was sold. There are seven stories, each depicting a snippet of Slayer life during various historical periods, from a countless Slayer realizing class difficulty during the French Revolution, to a girl bravely entering the service of the infamous Elizabeth Bathory's, to the answer of the mystery of Virginia Doe of Roanoke, to a Slayer dealing with race issues in Florida and the deep South during the 1950s, and I felt for every one of them, cheering when they were victorious, saddened when they did not. If you're a fan of Buffy, or if you're simply a historical fiction fan or into the supernatural/horror genre, then give this a read. I like this short story history of each slayer before buffy's time most of them irritates me and ended badly rip.Altho I only watched an episode mayhaps I'll revisit this show soon. Buffy is one of my favorite TV shows from the 90's. I still remember watching the premiere and thinking "wow- this is SO much better than the movie." One year, I was given this short story collection as a gift and I couldn't put it down. "The White Doe" - This tale follows the life of a slayer named White Do Buffy is one of my favorite TV shows from the 90's. I still remember watching the premiere and thinking "wow- this is SO much better than the movie." One year, I was given this short story collection as a gift and I couldn't put it down. "The White Doe" - This tale follows the life of a slayer named White Doe who ends up being raised by a local tribe of Indians after her own family and fellow colonists are killed by vampires. The tale is actually based on the real disappearance of the Roanoke Colony in the 1500's. "Silent Screams" - This story follows a slayer in the 1920's who finds way more than she bargained for when she goes to witness a movie being filmed. I'm trying to find something in common with how each girl died and what I've come up with is that they are all very impulsive and belive they are invincible. Most of them rush off to fight without any help. But I guess thats part of being a slayer. They fight alone and they die alone. p.s. Die Blutgrafin(very disturbing) and Mornglom Dreaming(liked her relationship with watcher and she faced the most interesting demon) were the best stories. But I have to also give a shout out to Silent Screams(w I'm trying to find something in common with how each girl died and what I've come up with is that they are all very impulsive and belive they are invincible. Most of them rush off to fight without any help. But I guess thats part of being a slayer. They fight alone and they die alone. p.s. Die Blutgrafin(very disturbing) and Mornglom Dreaming(liked her relationship with watcher and she faced the most interesting demon) were the best stories. But I have to also give a shout out to Silent Screams(which had a great narrator). "Everyone, the slayer thought ruefully, holds fast to the belief that the bad things within the world would always happen to someone else"
"When we were alone like that she often called me by my first name. When I had objected mildly, she had told me that we had a partnership and she had learned from her fathers business that partners were equals. Only some partners were more equal than others, judging from the amount of risk each took on a venture. We both new who the equal partner was between us. A Watcher may train the Slayer, but a Watcher will never be a Slayer." I thought that this may be cheesy but I must say that I couldn't put down the book. As a die hard Buffy fan, this book was nothing about Buffy but about what it was to be a Slayer and human. The stories were exciting! I can't wait to read volumes 2-4. Doranna Durgin's story was the stand out! Finally made it through this bad boy. This is the first full collection of short stories I've read, and I think that was why it took me so long to get through it. Most books make you attached to the story and characters, and that's what keeps you turning the pages. But with short stories, not only do you not get as attached to any particular characters, but you also start fresh with new characters every 40 pages or so. I'd say the collection was "pretty good". The concept is wickedly cool, and c Finally made it through this bad boy. This is the first full collection of short stories I've read, and I think that was why it took me so long to get through it. Most books make you attached to the story and characters, and that's what keeps you turning the pages. But with short stories, not only do you not get as attached to any particular characters, but you also start fresh with new characters every 40 pages or so. I'd say the collection was "pretty good". The concept is wickedly cool, and completely sustainable, as there have been Slayers since the beginning of time. Each story is set in an important period of history, like the French Revolution, or Hitler's Germany, and vampires are inserted into the events. Awesome idea. However, the writing was kind of hit and miss. Some of the stories were quite well written, but some were just pretty boring and amateurish. None of them terribly gripping. At the same time, props to some of those authors for tackling tough subjects. I'm generally not the biggest fan of short stories. I find them...short. This anthology jumps from slayer to slayer, and moves through two centuries. Some of the stories are brilliant, some are OK. While it was nice to meet other slayers, none of these stories significantly increased my understanding of the slayers, or the watchers. It was entertaining, but a bit shallow. Brilliant collection of tales from the Buffyverse. Highlights the short, often lonely lives the Slayers go through. I felt particularly bad for Britta and in a sense, Mollie. Enjoyable stories about previous slayers. This review has been hidden because it contains spoilers. To view it, click here. There are seven short stories in this book. There were four stories I liked more than the rest, though none of the stories stank to hell heaven or hell. These stories are one of the Slayer's downfall/mistakes or their death. There's a wide variety. "A Good Run, Greece, 490 B.C.E." by Greg Rucka is about the Slayer from that time called Thessily Thessilonikki (which reminds me of Thessaly from Neil Gaiman's Sandman series though this Slayer isn't as brittle and stand-off-ish as the witch). She ha There are seven short stories in this book. There were four stories I liked more than the rest, though none of the stories stank to hell heaven or hell. These stories are one of the Slayer's downfall/mistakes or their death. There's a wide variety. "A Good Run, Greece, 490 B.C.E." by Greg Rucka is about the Slayer from that time called Thessily Thessilonikki (which reminds me of Thessaly from Neil Gaiman's Sandman series though this Slayer isn't as brittle and stand-off-ish as the witch). She has to protect a runner to Sparta who will plea the Spartans for help for their home city Athens. The Persians are getting ready to land and attack Athens. There is a twist to who the Spartans and Persians are in this story, befitting the Slayer world. "The White Doe, London, 1586" by Christie Golden is a story of a transplanted English babe on the New World. This story I liked because the characters' passions were strong, though for some it was to detrimental effect. The Slayer wasn't raised a Council appointed Watcher, and while some Slayers aren't found in time, but this Slayer got the benefit of training, still. "Die Blutgrafin, Hungary, 1609" by Yvonne Navarro about a countess who is rumored to bathe in virgin's blood or drink the blood in order to stay young. There's a uncertainty about whether she's really a vampire or a monstrous human. "Unholy Madness, France, 1789" by Nancy Holder - I liked this one more because the Slayer has first obligation to French Royalty, then their nobles, then to whomever could pay for her services. This Slayer is completely different from what I expect - she's arrogant, snobbish, spoiled. But on further thought, I shouldn't be surprised, because being a Slayer doesn't instinctively give someone "nice" genes and "for the people" gene. What's neat is that this is on the cusp of the French Revolution. "Mornglom Dreaming, Kentucky, 1886" by Doranna Durgin was one of a 15-year old girl about to get married when she becomes into her destiny. This is a rare short story where it's not a vampire that a slayer slays, but something else. Anyone who wants to maintain a clear idea of the Buffy universe should know that none of these stories are considered canon. I'll be honest that I struggled to stay awake while reading this. However, I don't think it was the fault of the story because it had many interesting elements to it. It was a bit info-heavy and the timeline a little confusing. I really loved how it painted a picture of a strong woman able to succeed in the psychically demanding, heroic tasks facing her. Very Buffy-like. This story has so many racist ideas and themes in it. I could only stand to read up to page 47. Scanning the remaining pages I could see it did not get better, if anything it only got worse. My only criticism of this is that there is a little bit of stereotypes about "gypsies" (which is considered a pejorative term by some of the people to whom the term is applied). But it is only a line, or two, and is not an overarching theme. Also none of it read as hateful or mean-spirited. Because the term gypsy is used by the character to describe herself (like many people in the past and present have done) it has a some realism to it and doesn't feel problematic. The main character, Ildikό, is likeable and easy to relate to but the story has a disappointing climax and resolution. The watcher and slayer are unlikeable characters. The slayer does get better though. While interseting, the ideas in this story are not fleshed out very well. I appreciate this one for being easy to follow. Though the story is rather predictable it has a pretty neat monster. The slayer is a well-characterized as well. The only thing I didn't like about this story was that it misspells Hitler's first name as Adolph. That nitpick aside, I really enjoyed it. Nothing much to say about this other then I liked it. Taking the average of the stories I get about 2.7 so I round up to 3 stars. This is the first book in a series of stories about previous slayers. I bought the book with some concern, figuring that the entire book would simply dwell on how various slayers died. Fortunately, the book turned out to be much more than that. There are stories, of course, of slayers dying, but the stories mainly deal with the psychology of the times, the slayer herself, and sometimes her Watcher. The first story deals with a slayer in ancient Greece and is probably the weakest story in the book. This is the first book in a series of stories about previous slayers. I bought the book with some concern, figuring that the entire book would simply dwell on how various slayers died. Fortunately, the book turned out to be much more than that. The first story deals with a slayer in ancient Greece and is probably the weakest story in the book. That's not saying it's bad, just that it's not quite as good as the other stories. The second story deals with the late 1500's in England, and the birth of a slayer in the New World and centers not so much around the slayer herself as around the people's reactions to the slayer, some of those initially very good but ending up almost evil in nature. The third story deals with a slayer in Hungary in the year 1609. This is a story very much centered on a rather imperfect slayer who does not really listen to what her Watcher is saying, proving that not all slayers are "good" students of their council guide. The fourth story deals with a slayer during the time of the French Revolution and is one of the strongest stories in the volume, centering equally around the slayer and the conditions in France at the time. This story also shows how people are brought up the official policies of the government, only to find out that those policies may not really be good for the people. The fifth story deals with a slayer in Kentucky in 1886 and is a good story showing how a young girl must come to terms with being a slayer and being different, and then being shunned by those who accepted her before. The sixth story takes place in Germany in 1923 and is almost entirely Watcher-centered, this story showing that Watcher's themselves may not always be the paragons of virtue that Giles appears to be. The last story deals with Florida in 1956 and uses the slayer and her watcher as a way of seeing the evil of racial prejudice in full force in America of that time. I am a huge fan of Buffy and nearly everything that springs from its creative and addicting nucleus. Therefore speaking, I completely adored this book. While it's not about Buffy per say, it's more about slayers of the past and how they met their untimely ends. Comprising of several short stories Tales of the Slayer, Vol. 1 brings a lot of historics and badass slayers to the table. What happened at Roanoke? Vampires. Was Elizabeth Bathory a vampire? Who knows? This novel sheds an interesting ligh I am a huge fan of Buffy and nearly everything that springs from its creative and addicting nucleus. Therefore speaking, I completely adored this book. While it's not about Buffy per say, it's more about slayers of the past and how they met their untimely ends. Comprising of several short stories Tales of the Slayer, Vol. 1 brings a lot of historics and badass slayers to the table. What happened at Roanoke? Vampires. Was Elizabeth Bathory a vampire? Who knows? This novel sheds an interesting light on some big times in history. While there are plenty of different authors and writing styles in this book, I didn't feel myself put off at all by it, as I've seen mentioned in other reviews. Sure, I found some parts of certain stories to be a bit daunting (hence the four star rating) but, I still couldn't put the book down. My favorite story of the lot would probably have to be The White Doe, which dealt with Roanoke. I've always been curious about the place and this story certainly fuels my historical imagination. Not to mention how legend-like it felt to me. I feel that it could certainly take its place among other legends (albeit one with vampires) because it just sounded that darn good. I could only imagine how much more I'd have paid attention in History class if we heard stories like these about Slayers during those important eras of time. Recommend? : If you like Buffy, absolutely. If you like reading about vampires getting dusted, possitively. aahh yes, I really really enjoyed reading this book! I would definitely recommend it for all fans of Buffy. 'Tales of the Salyer' is a collection of short stories, each telling the story - or a brief extract - of the lives of the slayers. And all those stories are so different! I have to admit, the first story is not exactly a good start into these short stories and I did not really like it (neither plot nor writing style). It deals a lot with running... a aahh yes, I really really enjoyed reading this book! I would definitely recommend it for all fans of Buffy. 'Tales of the Salyer' is a collection of short stories, each telling the story - or a brief extract - of the lives of the slayers. And all those stories are so different! I have to admit, the first story is not exactly a good start into these short stories and I did not really like it (neither plot nor writing style). It deals a lot with running... and running... and running. so interesting! we've got native Americans, jealous people, nature and magic (to an extend that wasn't shown in the TV-show). Oh man, such a cruel and also spooky story! Loved everything about it, especially the atmosphere and the unanswered question..
very interesting demon! and this story shows (once again) how the life of one girl can change so much that her family does not accept her anymore..
MY FAVOURITE STORY IN THIS VOLUME! so dramatic, so emotional and unexpected! This is a collection of short stories based on the myth of the slayer from the television show Buffy the Vampire Slayer. None of these stories has any of the characters from the show and each story reflects different historical time periods. I liked this concept of telling the stories of different slayers and their respective time periods. I especially liked how some of the stories tied in with actual historical events or figures. All of the stories did an excellent job at conveying the atmospher This is a collection of short stories based on the myth of the slayer from the television show Buffy the Vampire Slayer. None of these stories has any of the characters from the show and each story reflects different historical time periods. I liked this concept of telling the stories of different slayers and their respective time periods. I especially liked how some of the stories tied in with actual historical events or figures. All of the stories did an excellent job at conveying the atmosphere whether it was 16th century Hungary or the deep south with racial tensions during the 20th century. The problem with this book is most of the stories were average. There are a couple of standouts but overall if one doesn't read this collection they will not be missing much. The White Doe by Christie Holden - Tons of references to early colonial America events and people; the Native American element felt similar to the type of fantasy you'd find in a Conan story. Unholy Madness by Nancy Holder - This one took awhile for me to warm up to, but the overlapping elements with the French Revolution were great at the end. Silent Screams by Mel Odom - This was the best written story, a fun take about silent movie vampires in Germany. I wish the ending wasn't as open ended though. This book is connected to the TV show Buffy the Vampire Slayer. 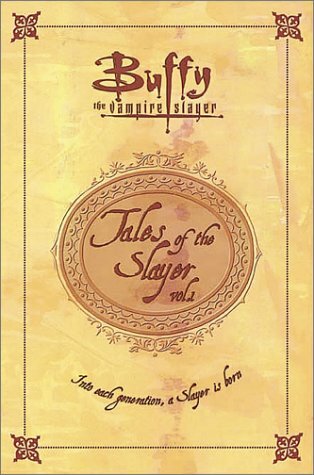 Its tales feature the slayers before Buffy became the vampire slayer. There is 7 stories in the volume, most of which are only okay and not memorable. Pretty much all of the stories were about the last days and battle of the former slayers. There were 2 stories I enjoyed. First was The White Doe by Christie Golden (actually, I think this is a misprint, I believe it is Christopher Golden) about a Native American tribe with a slayer kn This book is connected to the TV show Buffy the Vampire Slayer. Its tales feature the slayers before Buffy became the vampire slayer. There is 7 stories in the volume, most of which are only okay and not memorable. Pretty much all of the stories were about the last days and battle of the former slayers. As a massive fan of the Buffyverse I thoroughly enjoyed this collection of short stories. I especially enjoyed the way some writers tied in the Slayer mythology to historical events, giving it an interesting spin. I actually find it hard to pick just one story from this collection that I would mark as a stand-out because they are all so good in their own ways... I particularily enjoyed the stories following the Greek Slayer, the Slayer fated to be alone with her powers at Roanoke and the story foc As a massive fan of the Buffyverse I thoroughly enjoyed this collection of short stories. This review has been hidden because it contains spoilers. To view it, click here. Different authors imagine tales of past slayers. The brilliant thing with this series is that it can go anywhere, any time, with any character, and still fit within the series. In this anthology alone we get ancient Slayers, French revolution Slayers, a lost colony of Roanoke Slayer, and more. The stories were a bit uneven, some that piqued more interest than others. The narration on several was more difficult to read, especially Silent Screams. Most ended with the deaths of the Slayers, but a fe Different authors imagine tales of past slayers. This is an excellent collection of seven Slayer stories. If you've ever wondered who the Slayers were who preceded Buffy,then dig in. We learn about Slayers from ancient Greece up to Florida in the 1950's. There isn't a weak tale in the collection.I found it so clever how each author was able to fit the Slayers into each historical period. I loved this collection so much that I'll be searching the net and used book stores for the other Tales of the Slayer collections. I really enjoyed this short story collection. For some fans of the show it will be exactly what you've been waiting for, interesting tidbits of the lives of other slayers. Other fans will find frustration in the fact that (and this is mentioned numerous times in the television show) most slayers didn't survive long enough to become experienced, so a tidbit of their lives as slayer is all that there is. Really good book if your into the history of the past slayers, very hard to get into the book due to the writers changing between the stories. Would have been better to stick with one writer (instead of several writers) as the style of the writing changing almost takes you out of the book. Otherwise good plots and twists to keep you entertained, very good book if you're a fan of Buffy.